By Doson Chua, PharmD, FCSHP, BCPS(AQ) (biography, no disclosures) and Dr. Mustafa Toma (biography and disclosures) Disclosures: Dr. Mustafa Toma has previous received honoraria from Pfizer Canada, Servier and Novartis. Mitigating potential bias: Only published trial data is presented. Recommendations are consistent with published guidelines (Canadian Cardiovascular Society CCS 2016 Heart Failure Companion). Recommendations are consistent with current practice patterns. Treatments or recommendations in this article are unrelated to products/services/treatments involved in disclosure statements. Heart failure with a reduced ejection fraction (HFrEF) is the leading cause of cardiac death and hospitalization.1 Treatment of HFrEF is well established and includes therapy with beta blockers, angiotensin converting enzyme inhibitors (ACEI), angiotensin receptor blockers (ARBs) and mineralocorticoid receptor antagonists (MRA).2 These drug classes have proven to reduce mortality and are the cornerstone of medical treatment of HFrEF. Uptitration of beta blockers, ACEI, ARBs and MRAs to target doses is strongly encouraged. Diuretics and digoxin are employed for treatment of symptoms. Despite these therapies, the morbidity and mortality rate with HFrEF remains high. There have been no advances in drug therapy for HFrEF that have shown significant mortality or morbidity benefit for over 10 years. Current established therapies target inhibition of the renin-angiotensin-aldosterone system (RAAS). Endogenous natriuretic peptides modulate vasodilation, natiuresis and inhibit the RAAS.3 Enhancement of the endogenous natriuretic peptide system would be beneficial given its suppression of the RAAS and its positive neurohormonal effects on cardiac remodeling.4 This led to the development of the first oral heart failure drug, sacubitril, that targets the natriuretic peptide system. Sacubitril is the first in class of neprilysin inhibitors (NI) that was approved in Canada in late 2015. Sacubitril/valsartan was established in HFrEF treatment based on the results of the landmark, multicenter randomized controlled PARADIGM HF trial.8 In this landmark study, 8,442 patients with HFrEF (with an ejection fraction < 40%) in NYHA II-IV and on enalapril 10mg twice a day were enrolled. Enrollment also required a BNP greater than 150pg/ml or NT-proBNP > 600 pg/ml (BNP > 100pg/ml or NT-proBNP > 400 pg/ml if hospitalized in the previous 12 months) and treatment with an ACEI at a dose equivalent to enalapril 10mg twice a day. Patients with hypotension, GFR < 30ml/min/1.732, potassium > 5.2mmol/L or history of angioedema to ACEI or ARB were excluded. Once enrolled, patients were continued on enalapril 10mg twice a day for 2 weeks, then switched to sacubitril/valsartan (titrated to a dose of 200mg twice a day). If patients tolerated both drugs during this run in phase, they were randomized in a double blind fashion to enalapril 10mg twice a day or sacubitril/valsartan 200mg twice a day. Patients continued treatment for a median of 27 months. The trial was stopped early due to the benefit seen with sacubitril/valsartan treatment in HFrEF patients. The primary outcome of death from cardiovascular causes and heart failure admission was lower in the sacubitril/valsartan group compared to the enalapril group (21.8% versus 26.5%, p<0.0001, NNT ~ 21). Death from any cause (17% versus 19.8%, p<0.001, NNT ~ 36) and death from cardiovascular causes (13.3% versus 16.5%, p<0.001, NNT 31) was lower in the sacubitril/valsartan group compared to the enalapril group respectively. There was also a lower rate of hospitalization for heart failure in the sacubitril/valsartan group (12.8% versus 15.6%, p<0.001). The rates of hypotension (symptomatic hypotension and hypotension with systolic blood pressure < 90 mm Hg) was significantly greater in the sacubitril/valsartan group compared to the enalapril group (14% versus 9.2%, p<0.001). Sacubitril/valsartan had similar or lower rates of elevated serum creatinine, hyperkalemia, cough and angioedema compared to enalapril. Thus sacubitril/valsartan is proven to be superior to enalapril in the reduction of mortality and heart failure hospitalization, but had higher rates of hypotension. Sacubitril/valsartan may cause B-type natriuretic peptide (BNP) levels to be elevated and N-terminal pro-BNP (NT-proBNP) levels to decrease give the mechanism of action of NI, which can make interpretation of heart failure biomarkers more challenging. It universal adaptation in patients with HFrEF will likely be hindered by 2 factors. One factor is that sacubitril/valsartan causes more symptomatic hypotension compared to ACEI at target doses. A significant proportion of heart failure patients already are hypotensive and introducing sacubitril/valsartan may cause patients to experience more symptoms from hypotension. Another significant barrier to the widespread adoption of sacubitril/valsartan is cost. Sacubitril/valsartan is priced at $3.80 per tablet (regardless of dose), which translates to $7.60 per day or $2,775 per year in drug costs. The cost of sacubitril/valsartan alone would exceed the combined cost of all the other heart failure drugs and would put a financial burden on patients and private insurance plans. Sacubitril/valsartan is currently under review by BC Pharmacare, but as of December 2017, is not covered either primarily nor under special authority. Sacubitril/valsartan is the first in class of ARNI and has proven its superiority in reducing mortality and morbidity in HFrEF as compared to the use of ACEI. Sacubitril/valsartan should be considered in patients that still are symptomatic despite optimal or maximally tolerated guideline-driven HF therapies consisting of a beta blocker, ACEI/ARB and MRA. Monitoring of patients on sacubitril/valsartan is similar to ACEI (renal function, potassium and blood pressure). Senni M, Reyes A, Majercak I et al. Results of TITRATION study: A 12 week, multicentre, randomized, double blind, safety evaluation of a 3 versus 6 week up-titration regimen of LCZ696 in patients with HFrEF. Heart Failure Congress; May 23 2015; Seville, Spain. Presentation 44. Neprilysin is an endogenous endopeptidase which degrades natriuretic peptides (NP), bradykinin and vasoactive peptides. Inhibition of neprilysin prevents the degradation of endogenous NP and results in increased circulating levels of these natriuretic substances. This enhancement of the natriuretic system counteracts the deleterious effects of the RAAS as well as provides positive neurohormonal cardiac remodeling (Figure 1). 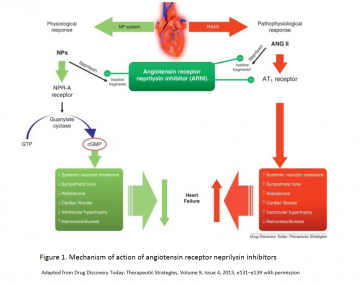 Neprilysin also degrades angiotensin II and thus, neprilysin inhibition may activate angiotensin II dependent pathways and promote RAAS activity.5 Concomitant inhibition of RAAS would negate these potential deleterious effects of neprilysin inhibition alone. Use of an ACEI in conjunction with neprilysin inhibitor was studied, but abandoned due to higher rates of angioedema with use of ACEI with neprilysin.6 Thus, sacubitril is marketed as a combination drug of sacubitril and valsartan and is the first in the class of angiotensin receptor neprilysin inhibitors (ARNI). Sacubitril is available as a combination oral tablet with equal parts of sacubitril and valsartan.7 The final dosage of sacubitril/valsartan is from the addition of the mg strength of each sacubitril and valsartan component and is prescribed as the total dose of both drugs twice a day (Table 1). As the authors point accurately point out, a limitation in the use of this drug will be hypotension. In the key trial, hypotension was an exclusion criteria. The trial also had a run in period so that those with adverse effects or no benefit were excluded. The real life use of this drug can be reasonably expected to have poorer results than the trial subjects so the 1 % improvement in mortality may not even be found. 1) The cost will be prohibitive for many patients unless covered by a third party. i doubt it will be initiated in primary care. 2) Why is it marketed as a combination pill with valsartan and not as a stand alone medication? Most medications start as stand alone and then become combination pills to help with compliance or cost after introduction. I tried looking for a trail to compare Enalapril V Valsartan in heart failure but only found a small brief trail. Though in one larger trial Valsartan seemed equivilent to captopril.